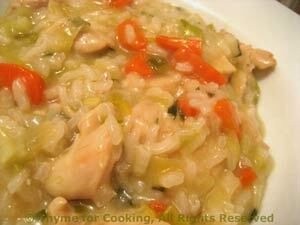 Creamy Chicken Tarragon Risotto, Thyme for Cooking easy one dish dinner. Tarragon is a classic pairing with chicken. A bit of carrot, leek and celery / celeriac make this a complete dinner, with just a hint of spring-time flavors. Clean and trim the leek. Cut it in half, the long way and thinly slice. In medium sauce pan heat butter and oil; add half of the leek and sauté until transparent. Add the rice and sauté, stirring, for 2 - 3 minutes until rice has white center. Before adding the last 1/3 cup taste a few kernels of rice. They should be just 'al dente' - slightly resistant to the tooth, but fully cooked. If more stock is needed add it 1/8 cup at a time and waiting until almost completely absorbed. At this point risotto will be thick but not stiff - there will still be visible liquid and it will not hold it's shape on a plate. Add the Parmesan, condimenti, stir well, pour into a bowl or risotto platter and serve immediately. Peel the carrot and cut in half lengthwise. Thinly slice into half-circles. Heat oil in medium skillet. 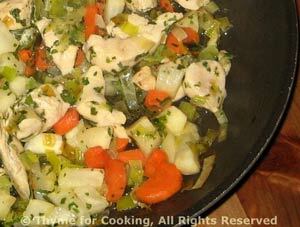 Add remaining leek, carrot, celery and sauté until tender. Add chicken and brown lightly. Add stock, tarragon, cover and simmer until chicken is cooked through. Turn off heat, add milk and keep warm until needed for risotto.